Product Consists: Bouquet of 6 Carnation with some fillers, 6 inch Teddy Bear along with Cadbury Dairy Milk Silk Chocolate (Weight: 60 gm). 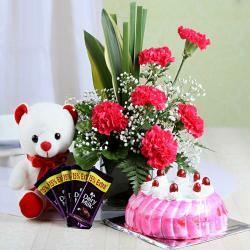 Celebrate the specialness gift has been designed especially for celebrating any occasion. You can gift this fabulous combo to your loved ones and friend for special occasions like Birthday, Valentines Day, Anniversary, Mothers Day, Fathers Day and many more. Also send this hamper for your loved ones along with other bewildering Gifts to India through Giftacrossindia.com and make your dear ones feel special. 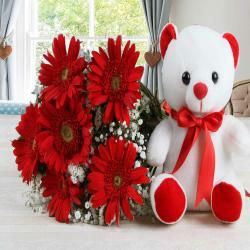 This season of love, gift your love ones sweetheart with amazing gift. 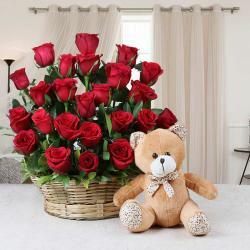 Surprise your dear ones with this lovely gift. 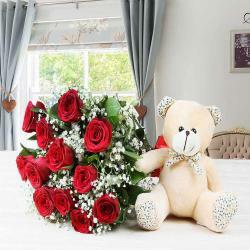 Product Consists: Bouquet of 6 Carnations with some fillers, 6 inch Teddy Bear along with Cadbury Dairy Milk Silk Chocolate (Weight: 60 gm).